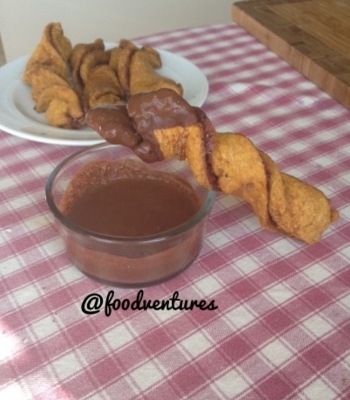 If you love cinnamon twists and churros you'll love this recipe. These are a soft version that can be made in 5-10 minutes and they're vegan! They are filled with a cinnamon, date caramel mixture, cooked, sprinkled with coconut sugar, then dipped in a chocolate or vanilla icing. Combine first 6 ingredients and mix well until a dough forms. Separate dough into 2 equal pieces. Using a rolling pin or even a drinking glass roll out both doughs into rectangles. Make sure they are both the same length and width. If using the protein powder, mix with the date caramel until smooth. On one of the rectangles spread some date caramel and cinnamon. Place the other rectangle of dough on top of the piece with the cinnamon date caramel mixture. Cut dough into thin strips. Carefully twist the strips and place on a large plate. Microwave 2-3 minutes until fully cooked. Sprinkle with coconut sugar. Dip in chocolate sauce (baking cocoa + water + sweetener), melted chocolate, or a vanilla icing (quest protein powder + water) and enjoy!